Its 462-pin socket accomodates AMD K7 CPUs and supports system bus (FSB) of 333/266/200MHZ. The KM400 Northbridge and VT8237 Southbridge chipset are based on an innivative and scaleable architecture with proven reliability and performance. Memory type of DDR333/266/200 SDRAM accomodates two unbuffered 2.5V 184-pin slots with 2GB memory capacity. Graphics: 64/32/16MB frame buffer using system memory – 128bit 2D/3D graphic Engine – High Quality DVD Video Playback. Audio: 16 -bit stereo compliant with AC’97 v2.3 specs. Expansion slots: One AGP 3.0 – Three 32-bit PCI v2.2 – Two 40 pin IDE – One Floppy interface – Two 7pin Sata – A Communication Network Riser (CNR) slot. Integrated I/O: Two PS/2 ports for mouse and keyboard – One Serial, One Parallel, One VGA, 4 USB, One LAN Support, Audio Jacks (Mic, Line in, Line Out). Let’s create a test script and call it try1.php and upload it to application/classes/controller directory. This is the deafault controller path. The default controller is welcome.php. 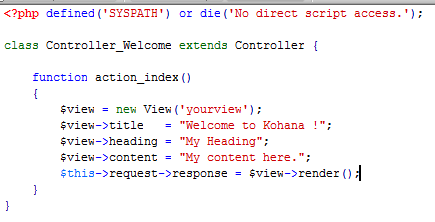 Controller is a Kohana class. All application controllers will extend this class. Your application may have just one controller, or it may have many, depending on how it is organised. A single method, index() is defined. If the controller is invoked without a method segment, this function is called. Loading www.technical-ebooks.com/dir/index.php was successful. It reports the Environment Tests have passed. Loading www.technical-ebooks.com/dir/index.php reports the same. When you load up www.technical-ebooks.com/dir/ in your browser, you should see hello, world! message. If you don’t see it, then reload the page in your browser (F5). When I loaded www.technical-ebooks.com/dir/index.php I get the same message of hello, wold! 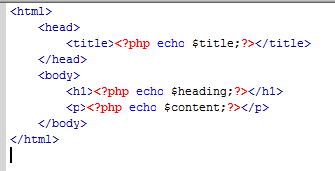 (Renaming install.php in above step is causing this change in behavior which is normal).